Recently I was building a WPF desktop application which required the use of a datagrid for the purpose of displaying a table of data. All was well (and simple!) until it came to using a combobox in a couple of the columns of the datagrid. 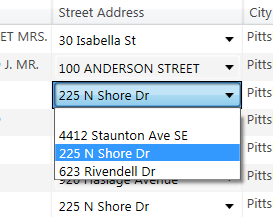 In my case, the requirement was that a combobox would allow the user, for each row, in the street address cell, to select from a list of dynamically populated values, as the right street address to use for that cell in that row, when the data would be exported. Sounds easy…right? Well it didn’t apear so at first because the DataGridComboBoxColumn which I had added to the datagrid in Blend wasn’t showing up in the column at all when I would load data into it. As I began to do ye ‘ole Google-it dance to see who else out there had encountered the same roadblock to fulfilling a similar requirement, I quickly began to realize it was not as obvious an interface feature as I had first thought it must be. So I decided I would record this on my blog, to perhaps help others who might find themselves searching for something similar. Now the data grid was actually showing combo boxes in the column…and the array of strings (StreetAddresses property of the data item type) was showing up in the comboboxes! ..and voila! It was not so hard after all, but also not very obvious if you didn’t already know. Now you do. This entry was posted in C# / .NET by Dylan. Bookmark the permalink. middle of 2018 here, and this helped me very much! that writing posts is boring and time consuming. using existing content (from article directories or other pages from your niche)? Thank you for a great column. Even though I am looking at it 3 years + later, it is still relevant. 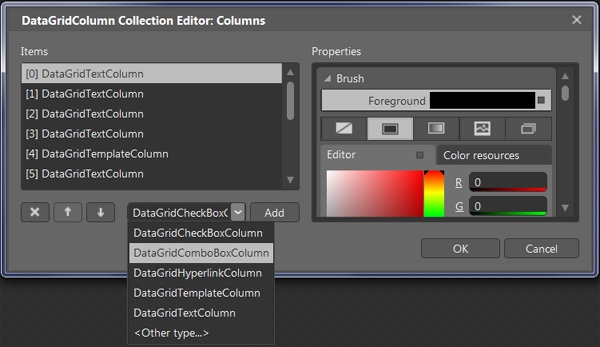 What does the entire XAML for the DataGrid look like? What was the DataContext? hi, please me .. how to solve datagrid combobox selection changed using XAML(wpf)??? using database data how to populate row details using combobox slection in datagrid ?? ?